On introduction there was a a single blue colourway called Watery. Two other colourways were said to be coming soon, but were never introduced. Watery is complimentary to the Ocean Blue bowls made on the 4th IOWSG Studio Day. Each piece is numbered and has it's own certificate signed by Timothy Harris. Rock Pool was introduced on 22nd September 2011 and was made available to members of the IOWSG Collectors Club only. 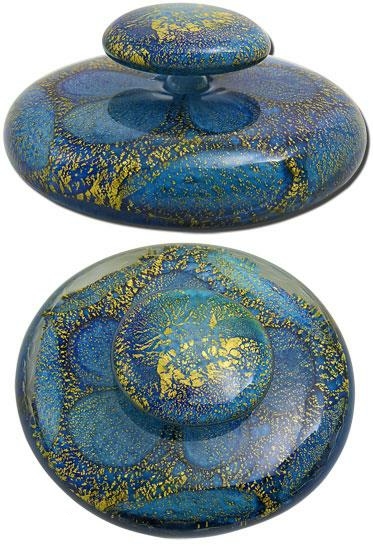 The design consists of two perfume bottles with flattened shape and pebble-like stoppers. Large perfume bottle, 11.5 cm diameter. Image courtesy of IOWSG.